Dunn Tire offers you the most comprehensive tire installation, maintenance, and protection package in the industry. We take pride in our world class customer service and guaranteed lowest prices. As an added service to our loya customers, Dunn Tire offers a 200% Price Protection Guarantee. 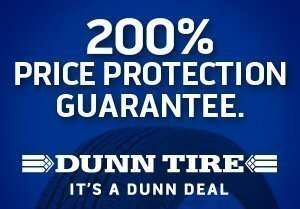 If you find a lower advertised price on identical tires*, with the same services, within 90 days of your purchase from Dunn Tire, we will refund you 200% of the difference. The 200 % Price Protection Guarantee excludes prior sales, any financing offers, package deals, pricing errors, mail-in offers, coupon offers, instant rebates, items that are advertised as limited quantity, Minimum Advertised Priced Policy tires as defined and required by individual tire brand manufacturers, out of stock items and clearance items. We reserve the right to verify a competitor's advertised price and the availability of the item.